David Letterman is heading to the end of his late-night career with the same guest he started with: Bill Murray. Murray was the guest on Letterman's next-to-last "Late Show" on Tuesday night. On Letterman's finale on Wednesday, there will be some surprise appearances, but no sit-down interviews. And the comedian went out in true Bill Murray fashion. Murray popped out of a cake that said "good bye, Dave" on it and then hugged Letterman, spreading cake all over the host's suit. "This guy's a professional," said a laughing Letterman. "If you kids at home want to try something like this don't forget the protective cake goggles." Murray was not the only guest on Letterman's penultimate "Late Show." 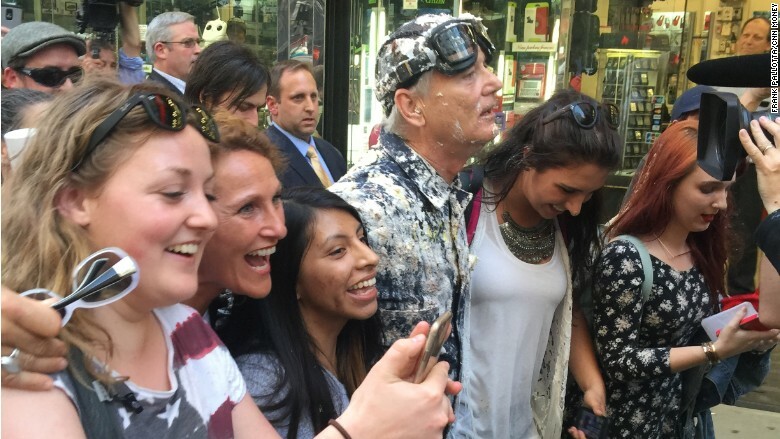 Bill Murray sent off David Letterman covered in cake. Regis Philbin made a surprise cameo during Letterman's monologue. "I can't believe you're ending the show," Philbin said. "I've been coming here for decades... but now you're leaving. So where does that leave Regis?" Philbin then tried to get a spot on Wednesday night's finale, but Letterman told him that unfortunately the last show was "booked." Letterman favorite and owner of the Hello Deli next door, Rupert Jee, was also on to take part in a montage of Jee's best moments on the show. As for Murray and Letterman, the two have had a long history together. 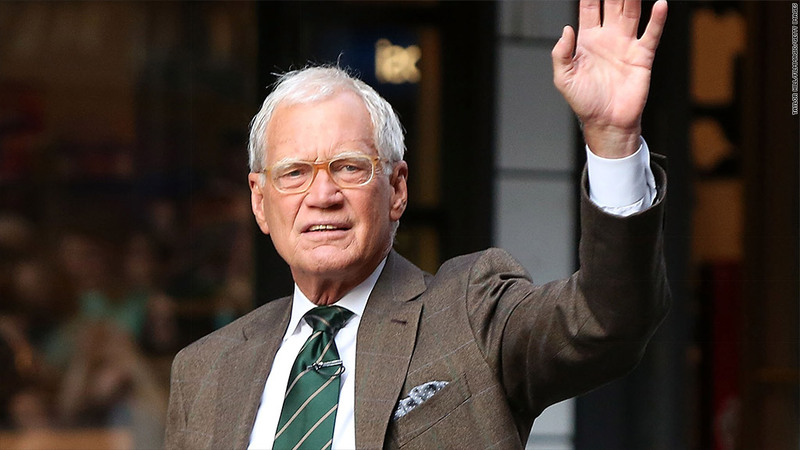 The actor was Letterman's first guest in late night when he appeared with Letterman in 1982 on NBC's "Late Night." Murray did the same thing a decade later when he was the first guest on the "Late Show" after Letterman moved to CBS in 1993. 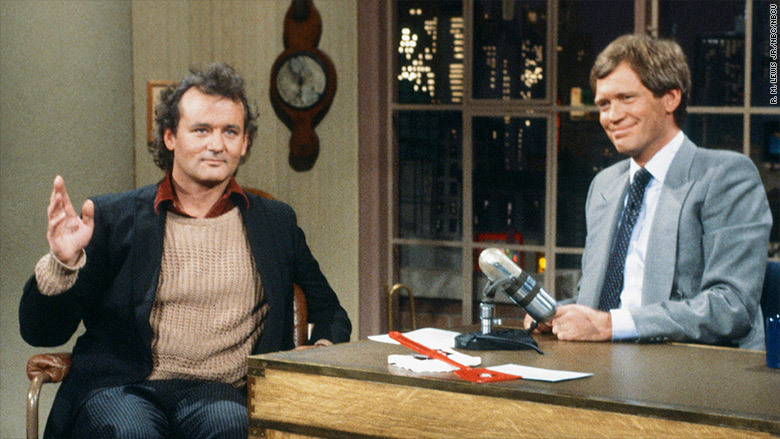 Through the years, Murray has been one of Letterman's most outrageous and noteworthy guests. Murray has flown into the show as Peter Pan, trained for the New York marathon by running outside the Ed Sullivan Theater, and appeared in many crazy costumes. Bill Murray has been one of Letterman's favorite guests over the years. Most famously, Murray pulled up on stage in 2013 in a Rolls Royce, holding a dog and dressed as Liberace. For many fans of the "Late Show," Murray is the quintessential Letterman guest. "Murray is not just a fitting last guest because he was Letterman's first. He's inextricably bound to Letterman because in many ways they've had the same career," wrote Time TV critic James Poniewozik. Poniewozik added that both became the "rare kind of performer: the comic who matures and learns to express a kind of wisdom without overturning the schmaltz barrel." Musician Bob Dylan also appeared on Tuesday night's broadcast to play the host off. It was Dylan's first TV appearance in more than 20 years. Dylan and his band played "The Night We Called It a Day" to end the show. As for the finale on Wednesday, CBS is keeping a lid on what to expect, only saying that Letterman's goodbye will include "surprises, memorable highlights, the show's final Top Ten List and more."